Strap for time? Pin this and read it later! We’ve all had those nights where schedules don’t allow you much rest time, and where you wake up feeling more tired than when you went to bed. That’s your body’s way of telling you that it needs more sleep, period. But what about those times where you just feel tired and you really don’t have a good reason? Maybe you’re spending enough time in bed and maybe you’re even getting close to the recommended number of hours for sleep. Even still, though, you feel zonked—tired all the time. If that’s the case, then it might be that something else is happening inside your body to make you more tired than you expect. Take, for example, your thyroid; it can run too fast or too slow and either one of those actions can lead to you feeling much more tired than you should. And you have to have medical advice for help with a thyroid. What else impacts restful feelings? “6 Reasons You’re Tired That Don’t Have to Do with How Much Sleep You Get” on Health Perch Below is my “version of facts” based on my personal experience of working with clients who suffered from exhaustion due to poor quality sleep and how we went about correcting it. Although anemia can take different forms, the common denominator is a deficiency of the red blood cells needed by the body to distribute oxygen via the bloodstream. If you have anemia you will most likely feel always tired, or you will easily get exhausted while doing any sort of physical activity. Other symptoms include shortness of breath, dizziness, pale skin, weird cravings for non-food items like dirt and ice (a condition known as pica), headaches, feeling cold, and being irritable often. If you think you may have anemia your first step should be an appointment with your GP for an evaluation. He/She can send you for tests and then confirm whether or not you’re anemic, what type of anemia you have, and the best course of action for you. If you are in the grips of anxiety you will most likely feel like your heart is trying to jump out of your chest when it’s not being squeezed by a g-clamp. Your thoughts are spinning fast in your head draining your energy, and anything and everything can trigger a rat-wheel of worry, dread, panic attacks and so on. Anxiety can actually make you feel drowsy while you are awake and all the tossing and turning will prevent you from getting restful sleep through the night. The result is that unshakable feeling of being always tired during the day. Mental and physical exhaustion are likely to make you irritable and short fused. You will be restless and have trouble concentrating thus making it difficult for you to get anything done at work or around the house. Other symptoms of anxiety include muscular tension, shortness of breath, headaches, and even stomachaches. If you suffer from anxiety you need to look at your lifestyle first and pinpoint the triggers. Then you must deal with them and take (baby) steps towards accepting or resolving the situations causing you anxiety. You could consider taking up activities that will help you relax like yoga, massage, exercise, walking outdoors, meditating, listening to music, making time for hobbies and for social events. Having a good chinwag with friends can do wonders for the anxious soul as can a solitary retreat. If none of these strategies work your best bet is to talk to a qualified counselor who will be able to help you out. I think we are all familiar with the sleepy feeling that follows a large meal on special occasions. But for those with food sensitivities, the sleepiness happens after each meal if they eat the wrong things for them. In fact, feeling physically fatigued and/or mentally sluggish after eating a certain food is one of the best indicators that you are sensitive to it. And we are not just talking about dairy and gluten here… eating too many starches on their own can also trigger sluggishness in those who have issues with insulin (hello post meal coma!). The most common signs of food intolerance are bloating, excessive burping, excessive farting, either diarrhea or constipation, feeling always tired and/or inexplicable muscle and joint pain that sets in some time after meals. If you are experiencing any of the symptoms typical of food sensitivities you are better off becoming your own metabolic detective. Start by keeping a food diary detailing the ingredients of each meal and how you felt after eating them. There are a number of culprits that might be the cause of your troubles: gluten and dairy are the big ones, but also any of the plants belonging to the nightshades family could be to blame. Sadly, these are all the lovely, funky veggies that make food worth eating but if you get rid of all of them at first and then reintroduce them one by one you should be able to find out which ones don’t agree with you. Hayfever is treacherous because it sends your immune system into overdrive, this drains your body’s energy reserves making you feel like your batteries are flat no matter how much you sleep or rest. Itchy eyes and a runny nose can make it hard to get a good night’s sleep, and many over-the-counter remedies designed to keep your symptoms under control can cause drowsiness as a side effect making you feel always tired. 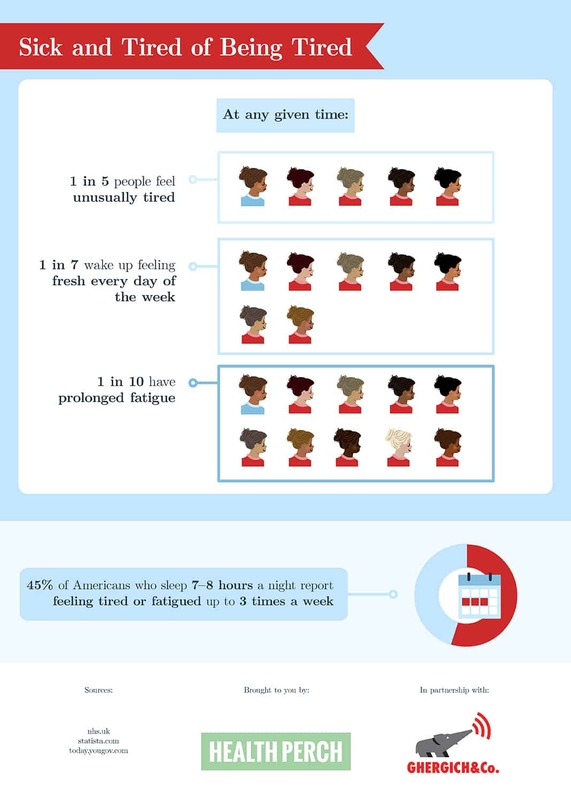 This is why when you get hayfever you feel extreme fatigue all the time. Again, good luck getting your GP to test you for seasonal allergies. In my experience the best you can get from them is a bottle of corticosteroids nasal spray. Although these are very effective at eliminating the symptoms of the hayfever they can cause side effects lasting many weeks. You could go privately but then again all you are going to find out is which pollens you are allergic to. The doctors can make you a vaccine based on your test results that gets injected under your skin weekly during Winter so that you have built up immunity by the time Spring comes round. I had this done and I don’t remember it being effective. The best thing to do is a quick lifestyle overhaul in the run up to the time of the year when you suffer from hayfever. Eliminate all foods that are known to cause allergies and intolerances, limit alcohol intake, rest more, avoid going outside at dusk and dawn when the pollen count is higher. If you become light sensitive wear sunglasses everywhere and if you can shower often during the day to wash off any pollen stuck to your skin. If you have pets who live outdoors brush them before you hug them as they will have pollen stuck to their furs. Make sure the pollen filter in your car aircon system is clean and set it to recirculate the air in the cabin to be on the safe side. Obstructive sleep apnoea happens when the walls of the throat relax and narrow during sleep, interrupting normal breathing. It’s a fairly common condition that leads to your sleep being interrupted regularly throughout the night and restricting the amount of oxygen that gets to the brain leaving you sleepy and always tired during the day. Although the condition itself isn’t too serious the consequences can be disastrous as your fatigue can affect your ability to concentrate and put you a risk of accidents at work or at the wheel. Snoring is a less serious condition and one of the symptoms of OSA. Although its effects on the person who snores are less serious the noise can affect their partner’s quality of sleep placing them at increased risk of accidents from lack of concentration. In fact, snoring is one of the top reasons couples divorce in the UK. Some of causes linked to sleep apnoea are being overweight, being male, going through the menopause, being over 40, using sleeping tablets, having congenital unusual neck structures, smoking, drinking alcohol (especially before going to sleep) and nasal congestion. Because sleep deprivation puts the body under severe stress if you suffer from sleep apnoea you are also at increased risk of developing cardiovascular disease, depression, diabetes and memory loss. If you or your partner think you may be suffering from sleep apnoea you should go and see a doctor straight away. You can tackle lifestyle factors that may cause the issue for you but it’s better to be checked out to eliminate the possibility of anything sinister causing you to not breathe properly while you sleep. Thyroid disorders affect 1 in 20 people in the UK and although women are more at risk, they can also affect men, children and babies. There are two types of thyroid disorder: when the thyroid is overactive (hyperthyroidism) and when it’s underactive (hypothyroidism). The thyroid gland produces hormones that regulate your metabolism: if too many are produced your metabolism works faster and this can lead to an increased heart rate, anxiety, irritability, more bowel motions and difficulty sleeping. If not enough thyroid hormones are produced your metabolism will slow down causing you tiredness, weight gain, constipation, depression, tingling in your hands and fingers, heavy periods. If you suspect that a dysfunctional thyroid may be the cause of you feeling always tired go and see your GP straight away. He or she will refer you to an endocrinologist and request tests to measure your thyroid function. If you need to you will be prescribed medications to normalise your thyroid function. Both types of disorder can lead to more serious consequences if left untreated, in the case of hyperthyroidism you might even experience a thyroid storm which is a life-threatening condition in which all your symptoms suddenly escalate. As far as lifestyle factors go the usual advice applies to trying and manage your thyroid function. This is regulated by the hypothalamus and the pituitary gland which act a bit like a thermostat for your metabolism: if things are moving too slowly or too fast the hypothalamus sends a message to the pituitary gland to tell the thyroid to produce more or less hormones. The pituitary gland is very sensitive to your diet and therefore you should take great care to avoid foods containing refined sugars as well as high glycemic foods. As you can see your constant fatigue may have different causes that cannot be resolved by simply sleeping more (although if that’s what your body tells you to do, listen carefully). You really need to investigate the reasons behind your tiredness and take action to correct them. A good place to start is always your lifestyle with an emphasis on food choices, movement and exercise. Eating food that supports your body chemistry can go a long way to help your endocrine system work efficiently and regulate your metabolism so that you have energy all day long, can get restful sleep and can keep your weight under control. The correct exercise protocols can also help you do this as does looking at sources of both physical and emotional stress. Napping can help you feel better when you are always tired. A recent study showed that taking a 30 minute nap completely reversed the effects of sleep deprivation. The stress hormones caused by lack of proper sleep were completely gone. If this isn’t enough always consult your doctor before reading another blog post as the quicker you take action the quicker you will be able to enjoy restful sleep every night. This entry was posted in Lifestyle on 18 June 2018 by Cristina Alciati. Short of time right now? Pin this and read it later! It is Men’s Health Week 2018 from the 11th to 17th of June and this year the focus of the week for men’s health issues will be on diabetes. Men are more likely to get diabetes, more likely to suffer complications, face amputation and are more likely to die from diabetes. If we truly value the men in our lives more needs to be done to prevent this from happening. Don’t be afraid to think for them because, unfortunately, it’s quite common for men to still feel uncomfortable talking about issues regarding their health and we need to act now to change things. What can you do to help prevent men’s health issues? As this year we are focusing on diabetes here are 5 simple steps you (or your male friends/relatives) can take to avoid becoming another statistic. Men are more likely to be overweight than women and can develop diabetes even when they are relatively lean. However they are less likely to acknowledge that they are indeed overweight and therefore sign up for a weight loss programme. What they should be focusing on instead to prevent diabetes is reducing belly fat. It’s a problem because belly fat lurks not just beneath the skin but also gets down deep and surrounds your vital organs (visceral fat). A large amount of visceral fat can increase the body’s resistance to the hormone insulin and this can lead to type 2 diabetes. This is because when it is being used as fuel visceral fat releases inflammatory compounds into the blood stream increasing the risk of metabolic diseases such as diabetes. Subcutaneous fat, on the other hand, doesn’t pose as much of a health risk but it’s notoriously more stubborn to burn than visceral fat. Green Tea Extract (EGCG) can be helpful in persuading the body to burn stubborn subcutaneous fat, whereas Curcumin can help you counter some of the inflammatory effects from burning visceral fat. 2 – Exercise regularly most days of the week. This helps you manage weight, reduce blood glucose levels and may also improve blood pressure and cholesterol. If you believe you may be at risk of developing diabetes and you have a fair amount of belly fat you want to prioritize short but intense exercise sessions over long steady cardio. Always take into account your body type when creating an exercise programme to make the most of your metabolism. Make leisurely walking and sleeping important parts of your workout regime as they will both help you lower the hormone cortisol which contributes to increasing belly fat. If exercise is not for you, or you can’t do it, make sure you spend a lot of time moving: puttering around the house or the garden for a couple of hours every day will be beneficial and so is choosing the staircase over the lift. 3 – Eat a balanced, healthy diet. In a nutshell: reduce the amount of saturated and trans fats. Eat more fruit, vegetables and high-fibre foods. Cut back on salt and increase your water. But also make sure you cut back on your starches and sugar and don’t make the fatal mistake of drinking your calories. Leave the bottle of cordial on the shelf and stick with the mineral water instead. When planning your meals make sure to start with a good source of healthy protein to which you will add as many fresh vegetables as you can possibly handle. Be careful though that beans and potatoes are starches so don’t overdo it. The Paleo Diet by Dr. Loren Cordain is a good place to start for understanding how food choices can have an impact of men’s health issues. 4 – Limit takeaway and processed foods. Microwave and takeaway meals are usually high in salt, fat and kilojoules. It’s best to cook for yourself from scratch if possible and if you have most of your meals on the road try and reduce the amount of starches that you eat. Having said this don’t be afraid to go all out from time to time, just make sure you don’t have takeaways or convenience foods all the time. 5 – Limit your alcohol intake. Too much alcohol can lead to weight gain and may increase your blood pressure and triglyceride levels. Men should have no more than two standard drinks a day and women should have no more than one. But a better choice would be 5 glasses of wine per week max. Drinking too much alcohol places the liver under a lot of strain. This stress is likely to raise cortisol levels and cause you to gain belly fat, lose muscle and become at increased risk of developing a metabolic disorder like diabetes or experience a whole other lot of men’s health issues. Remember that too much alcohol can lower your T levels too! What’s the best alcoholic drink to have to minimize the risk of experiencing men’s health issues? Beer and white wine. They both act as appetite suppressants and when consumed in low amounts don’t have too much of an impact on your metabolism. The best time to have a drink? Immediately after a weight lifting session. What else can you do to prevent men’s health issues? If you suspect your health may be a risk due to lifestyle factors like stress, lack of sleep, unhealthy diet and not enough exercise let me help you create a bespoke program that will address all of the above and help you re-establish a good balance. It all starts with a free, no obligation, breakthrough call. This entry was posted in Lifestyle on 11 June 2018 by Cristina Alciati. Working on a fitness makeover can be a lonesome time for some. My experience as a coach is that a lot of clients are almost ashamed to admit to their friends or colleagues that that’s what they are trying to do. So they tend to isolate themselves and keep their weight loss journey a secret for fear of failure and having to hear “I told you it wouldn’t work”. There is a lot of conflicting information available on the subjects of fitness and weight loss and it’s very difficult to navigate through a myriad of journals, articles and blogs to decide what might be a good path to follow. I know, I have been there too. The trick to getting a great ROI for your efforts is to find a protocol that is easy to jump into and that you can follow over a long period of time, turning it into a new set of healthier habits as opposed to a collection of remedies. There are many effective frameworks to choose from and really what works for one person might be disastrous for another one. Regardless of which protocol you decide to follow and what’s right for you, if you want to be successful at shrinking a dress size (or three) you must be aware of a number of common mistakes that people make which can thwart their efforts. Avoid these and your chances of achieving your goals will skyrocket straight away. The figure you see on the scale can be extremely depressing if it’s not changing but in reality it’s probably the last thing you need to worry about. Female body builders and athletes are often tiny creatures that nevertheless weigh a tonne. Why? Because they are muscular, yet they can be so minute that you wonder if their legs would snap in strong winds. By the way, not everyone can reasonably expect to achieve this level of leanness but most people can get very close to it if they really want to. The better strategy would be to focus on achieving an hourglass shape and measure your progress by taking measurements around your chest, waist and hips at regular time intervals. This change is an indication that your hormones and metabolism are in good balance and therefore you are losing fat which is far more important than losing weight. Especially when you start shedding the pounds of visceral fat, the nasty stuff that accumulates around your organs putting you at an increased risk of developing life threatening illnesses. So, don’t give the scale that much importance – focus on your health and the slimmer figure will soon follow. When you cut back drastically on the calories or eliminate entire food groups from your plate you are asking for trouble. Your metabolism doesn’t work in a linear way and tends to be adaptive and reactive: whatever action you take, it answers back. Usually not in the way you want it to as its primary objective is to maintain the status quo. So you need to learn to play its game. Although some would argue that when you first cut back on the calories you seem to lose both weight and circumference, after 4 to 10 days of low calories and zero carbs you will reach a plateau. Chicken and broccoli can be very nice… but not all day every day. To lose fat you do need to cut back on the calories a little bit but if you deprive yourself of all the foods that you like your willpower will soon get weak and you will start to crave cakes and chips. Eventually you will cave in and go on a binge, cry crocodile tears the next day and start the dieting process all over again. Never really going very far in your journey. The better way of managing your food intake is to find the combination of macro nutrients (protein, carbs, fibre and fat) that you find satisfying and keeps you full for a good 4 – 5 hours, doesn’t make you dream about a pizza the size of the London Eye, gives you steady energy all day long and yet causes you to lose fat. Once you find your very own Holy Grail of macros you are in fat loss Heaven: you have discovered your unique formula and you are set for success. If you count the calories at this stage you will find that you are naturally consuming less without trying. Have you noticed how most chain gyms, on average, have 40 cardio machines and one chin-up bar? There’s a reason for it: most people on a crusade to atone for their indiscretions at the dinner table think that if they spend an hour or more on the treadmill every day they will wash away all their sins. The truth is that they are in fact most likely to make matters worse. Sure, if your body type tends towards endomorph you will benefit from long cardio sessions more than others but still, you could save yourself many hours of drudgery by switching some of your long distance cardio with High Intensity Interval Training plus resistance training. I know, I know… everyone keeps mentioning it… the reason being that it works. HIIT cardio saves you time because you only do it for a few minutes at the time. Resistance training doesn’t need to take up a lot of time either and it will help you build the muscles that will keep your metabolism running at a slightly elevated rate day and night. The butterfly approach to resistance training usually stems from the individuals not knowing what they are doing. I see this often when I go to the gym: people doing 10 reps on each machine and then moving on to the next one in random order. Even when they use the machines correctly they are missing out on an important factor when exercising for fat loss: overload. When you exercise a muscle group to the point of overload (i.e. when it burns so much that you want to curl up and cry) you are stimulating muscle growth. This is what will eventually give you the toned look that so many women want. And ladies, don’t worry about looking like a man and growing a beard: you don’t have enough testosterone for that. The “bulky” effect that so many women worry about is usually temporary and it’s due to the subcutaneous fat laying on top of your muscles. You will shed this. As your muscles grow your metabolic rate at rest will increase slightly causing you to burn a little bit of fat 24/7. So if you want to succeed at shrinking dress sizes you really want to choose 4 or 5 resistance exercises for your session and focus on working those muscles until you burn like crazy. Whether you do full body workouts or split routines isolating specific muscle groups depends largely on which program you wish to follow and the results you wish to get. But in either case you want to work each muscle group hard. And then rest it. Just as you wouldn’t launch yourself into an entrepreneurial venture on the fly you wouldn’t want to start a weight loss project without a solid plan. This will include a time for researching and discovering how your metabolism works, a time to act on the outcomes of your research, a time to assess progress, adjust the course as necessary, more execution, more assessing, more adjusting and so on until you succeed. As you get closer to achieving your goals you may want to start thinking about how you are going to maintain your results over time. This plan is perhaps more important than the first one as fat loss is more of a lifestyle than it is a fixed length journey. If you revert to your old habits the moment you hit the perfect size 8 you won’t remain there for long. Should you lose your inspiration half way through you need to read this post. As cheesy and cliche’ as this sounds, getting help from a mentor can speed up your results in dramatic ways. You know that’s true in your business so you must accept that it’s also true when it comes to fitness and fat loss. And yet so many people think they know it all and rely on YouTube videos to get fit only to end up concluding that “none of this malarkey” works some time down the road. Choosing your mentor is a little bit like choosing a lifetime partner or a friend: you get along well naturally, you are on the same page most of the time, he or she can fill in the gaps in your knowledge and can explain things in a language that you understand, you respect each other, you feel comfortable calling them up for a chat if you have any doubts, they help you feel good about yourself AND they will help you cut through the fluff to make your transformational journey as linear as possible despite its non-linear nature. Believe me, it works. So there you have it. The next time you decide that you want to lose weight and look toned remember this post and make sure to avoid points 1 to 5, go straight for number 6 and book a complimentary breakthrough call to make you sure you walk down the right part immediately and save yourself time, stress and money in the process. This entry was posted in Lifestyle and tagged errors, fat loss, hiit, long distance cardio, mentor, mistakes, slow pace cardio, too much cardio, weight loss on 20 March 2017 by Cristina Alciati. It’s quite normal to hit roadblocks and get stuck in a funk whenever we embark on a project of any kind and health overhaul and fitness projects are no exception to this. People often start off with the intention of improving their health, wealth and fitness levels on Jan 1st each year with all the zest in the world only to find themselves having a crisis somewhere down the line. By crisis I don’t mean accidents, misfortune or failures. The worst thing that can happen to any of us is reaching the moment when we wake up and realize that we have lost our mojo. We no longer care about being fit, healthy and wealthy, we don’t want to get out of bed, can’t be asked to make an effort and being social is not an option. And yet life goes on and so do we. What can we do to get back on track with our fitness makeover project? Your mindset is the key to success. You will never see any fat loss program through to the end unless your head is in the right place. In fact, being in the wrong frame of mind will often prevent you from getting started altogether. This is, in my opinion, one of the biggest obstacles that a lot of people face in the beginning. Let’s take my client and friend Lori for example. It’s not unusual for her to work long hours every day of the week doing mostly physical work. It’s a well paid job and she loves it but it takes a toll on her physique and her moods too as she seldom gets to spend quality time with her family in between work, cooking, house chores and sleeping. She is in her mid 40’s and she has been carrying a little bit of extra fat around the middle. Like most women do when they approach peri-menopause. In the past she joined a weight loss group and lost a lot of weight but eventually gained it back with a little bit of vengeance and is now unhappy with both her weight and shape. Her body type is somewhere in between an ectomorph and a mesomorph and so the spare tyre round the middle is even more prominent as her limbs are long and slim. Whenever we meet she talks about “going on a diet”. She is not happy about the prospect of dieting as she sees this as a period of time in which she will have to make sacrifices and give up all the foods she loves in order to lose 10Kgs in time for her Summer holidays. Because she hasn’t quite set her mind on a date when the dieting is going to start she is making sure to fill up on large portions of all the comfort foods she can find: fish and chips, pies, mash potatoes, beans, jacket potatoes drowned in butter, sausage rolls, etc. not to mention cakes and chocolates and the occasional glass of wine. The point here is that this “giving things up” is only meant to be temporary, until she has had her holiday and then she is most likely get back to her old habits. Because in her mind the sacrifices have to end once the reward has been obtained. My other client Carol has instead rejected the “dieting mindset” altogether. In order to get the results she wanted and keep them over time she accepted that she had to embrace change and create a new way of doing things for the rest of her life. Not radical changes, just a few tweaks to her meals here and there with a view of including all of her favourite foods on a regular basis but in moderation. In fact, over time, she stopped wanting her “favourite” foods which were high in carbs and saturated fats and instead elected more fat loss friendly foods as her new “favourites”. With regards to exercise she started off wanting to do this 3 times per week but soon discovered that it was hard and stressful to fit 3 workouts around her existing commitments and so she settled on two sessions per week that she could easily find the time for. This allowed her to remain consistent with her efforts thus reaping the rewards in the form of a different shape and the slow but progressive release of fat from the more stubborn areas. As time went on she was able to sustain her new habits knowing that if she “slipped” from time to time, like she might do at Christmas, she would soon be able to go back to her routine and lose all the festive plumpness in a fairly short time. The compliments started to pour in fairly soon and she became even more inspired to stay the course. Do you see the difference in the mindset? One client is dreading getting started because of the perceived sacrifices she will have to make whereas the other one was willing to learn how to read her own metabolism and embrace the changes that worked for her. Not what the latest fitness fad says she should do. Needless to say Lori has been having frequent guilt trips every time she has a slice of cake or an extra portion of chips, whereas Carol can’t really be bothered to have either but if she does she enjoys the cake or the chips knowing that she will be able to use them to her advantage. The first step was to take a good look at Lori’s weekly schedule to determine just how much walking and lifting she did during the course of her work. The answer was mildly shocking: it turned out that she was on the move all the time and constantly lifting and carrying moderate weights over short distances. This was great news in a way because movement is actually more beneficial than structured exercise for your health and wellbeing BUT too much of it will start causing issues with rising levels of cortisol resulting in increased belly fat. The same goes for adding exercise to a lot of movement. We decided that we would skip the exercise altogether for the time being and we focused on slowing down the pace a little bit at work by changing from a fast walk to a normal walk. We then tried to create a good sleeping routine as this was an area that she struggled with somewhat. We found a good time to go to bed every night and eliminated any stimulants for up to 3 hours before bed time: no coffee, no wine, no tea, no chocolate, no tablets or electronics. This worked relatively well but she found that her mind was often racing when she first lay down in bed and this meant a lot of tossing and turning before she could fall asleep. So we went back to the drawing board and found that for her the best thing to do was to have a little bit of wine half an hour prior to bed. Although this wouldn’t be a good policy for some it worked brilliantly for her: not only she could almost fall asleep on command, she would also stay asleep waking up feeling rested and refreshed. In addition to “fixing” her sleep we tried to find times throughout her day in which she could relax by perhaps adding 5 minutes to her bath or just chilling with her family. She started to benefit from these small changes fairly quickly. Before we even looked at her diet she already lost a little bit of fat all over but especially around her midsection. Nothing dramatic but a good step in the right direction AND she loved it. Most importantly she felt that so far she didn’t give anything up and instead gained in relaxation and downtime. Win. Once we established the new routine we started to look at her diet to see where we could introduce changes that would support her fat loss efforts. Her problem was the large amount of foods combining fats and starches that she was consuming on a weekly basis. This was both because she loved them and because they were convenient as she often bought them ready made from the grocery store and only needed reheating. The first change was to replace some of the starchy foods with fresh non-starchy produce. She was game so for a couple of weeks she made herself bring a salad to work instead of a pastie. We left the option open for her to have starches for dinner but bearing in mind the glass of wine before bedtime (this counts as carbs). After the first two weeks she found that she didn’t really fancy anything other than the meat + salad for lunch as this was keeping her full and feeling better than when she ate convenience foods. Plus she became very creative with the mix of veggies that she used by treating her salad almost like a work of art with lots of different colours and textures. She also learned how to make dressings that were both interesting and flavoursome without adding too many calories from either sugar or fats. At this point the results really started to show. Her skinny jeans became baggy around her hips and thighs and the muffin tops were soon gone. Most importantly, again, she felt that she gained from the changes instead of losing out. Win. As soon as she abandoned her dieting mentality she was able maintain her new shape and size and to help her get a little bit more toned before her holiday we introduced some exercise. But not all in the form of workouts… because she had very little spare time available we decided to make the most of her work at the warehouse. We agreed that every time she picked something up or drop something on a pallet she would do a squat to get to the right height and then, when possible, she would do a biceps curl to lift the object close to her chest and then reverse the movement. Squats are a great compound exercise and can strengthen your legs, glutes and core muscles simultaneously. When you learn to do them correctly and to apply them to everyday situations you will find that lifting heavy objects becomes a lot easier and you won’t tire out so quickly. Lori found this change also easy to implement and whereas she managed to do a few squats here and there at first, she was soon able to turn this into her normal way of lifting things. At this point we introduced workouts at home too but these only consisted of doing a few push-ups and planks a couple of times per week to make sure her upper body also looked a bit more muscular. These exercise sessions would only take up 10 minutes of her time so she found it easy to stick to them. As she got closer to the start of her holiday she was delighted with the results and still surprised that she went through a complete body transformation without dreading the process or feeling like she had to make sacrifices. As you can see it’s as simple as changing your perspective about nutrition and exercise to make the experience more interesting and certainly not one to fear. Once my clients get over this initial hurdle and make the mental switch they begin to enjoy the process of change knowing that they will achieve and often surpass their initial goals. If you are stuck and can’t find your way out of the dieting mentality book a 30 min. complimentary breakthrough call and I’ll gladly give you a few pointers. This entry was posted in Lifestyle and tagged attitude, body transformation, careful planning, dieting mentality, fat loss, mindset, seamless integration, weight loss, winning on 20 February 2017 by Cristina Alciati. She got into the best shape of her life. After 40. A case study. No time to read right now? Pin this and come back to it later. Belinda (nor her real name, of course) was a housewife who became a mother later in life, in her late thirties. Like the majority of my clients, she came from a privileged background: living in a luxurious country home with her family and with plenty of time and resources to pursue her interests. When I met her she was in her early forties and was starting to feel the effects of the peri-menopause. She was in a fairly good shape, her body type was mostly ectomorph and therefore she was naturally lean. However she felt that she was starting to accumulate fat around her lower body and on her belly and was finding it very hard to shift it. She dedicated the previous few years to raising her young children and so she didn’t have the opportunity to do any of the physical activities that she used to enjoy pre-motherhood. That’s when she sought my help. She recently discovered that she was suffering from an autoimmune disorder that affected her digestive tract. She was under the care of a (private) medical specialist who was carrying out tests to establish the exact nature and severity of her problem. Whilst doing various blood tests it also transpired that she was deficient in a number of vitamins hence she was feeling lethargic most of the time. The first step to get her into the best shape of her life was to create a bespoke fitness program that would seamlessly integrate multiple exercise sessions each week into her existing schedule. We also looked at her nutritional habits and where she could make changes to both support her weight loss goals and help her manage her autoimmune disorder. We devised an initial protocol and we set to work. It soon became apparent that although she said she wanted to change she wasn’t willing to actually make the changes that we discussed. For some reason, despite the fact that we established a pattern of tummy aches after eating certain types of foods, she resisted the idea of cutting back on them. She seemed to be able to come up with the most creative “reasons” as to why she couldn’t possibly do it. Keeping up with the exercise regime was easy because I was personally there to make it happen, but the nutrition side of our plan was a bit tricky to manage. Although her body was becoming stronger and more shapely as the weeks went by she wasn’t quite achieving the “best shape ever” that she was hoping for. After many tests her consultant concluded that she was suffering from coeliac disease and backed up my nutritional suggestions to avoid gluten rich foods and try the gluten free versions instead. She was also prescribed vitamin supplements and injections to help with her energy levels. Unfortunately people affected by a gluten intolerance can suffer a fair amount of damages to their intestinal tract. This makes the absorption of nutrients difficult and even when eating all the “right foods” you can still end up suffering from malnutrition and a lot of inflammation. Taking digestive enzymes can be of help as they break down the food in such a way that makes absorption of nutrients easy. They are not a cure but they can be extremely useful in these circumstances. As soon as she incorporated these simple changes into her diet her body also started to change. The bloating was gradually disappearing and so was the slight water retention. As the vitamins were starting to take effect her energy levels started to increase. We were on a winning streak and heading towards that best shape ever but then… she started slacking with the exercise and now the “reasons” were being used to justify why she could no longer find 10 minutes to do a round of Tabata intervals once or twice per week in between our metabolic boosting workouts. The big turnaround came when the holiday was booked and at that point she suddenly transformed into Mrs Motivator. She never skipped a workout with or without me there. She discovered that she had the determination of the Terminatrix within her and she wasn’t going to stop until she got into her “best shape ever”. In fact, I had to start reminding her of the importance of rest periods and letting go from time to time! Rest and relaxation are always important aspects of any fitness makeover but they are super important once you get past 40 and start the journey through peri-menopause and menopause. Belinda’s turning point was the prospect of feeling insecure whilst wearing a bikini, that perceived pain became stronger than the pain of having to sweat her heart out doing intervals on her exercise bike or lifting heavy dumbbells. This is a common issue with women over 35. We all age at different rates but we all age. And as we slowly turn into our grandmothers we feel that our sexiness is vanishing and we become invisible and unattractive to our partners. Of course, we know very well that there are more important qualities than beauty that bond us to our mates but we are also instinctively aware that we cannot escape our true nature as visual creatures. after a few weeks of doing everything I told her to do Belinda looked absolutely amazing. She had curves in all the right places and every inch of her body was screaming “fit!”. Her lower body fat was barely there, her tummy was flat and all her clothes started to fit more comfortably. She regained the body shape and freshness of her younger self and was looking radiant. It was as if she turned the clock back ten years or so. Needless to say she was ecstatic and her husband very appreciative too! Oh… and her life started to blossom in other ways. As she reconnected with her youthful self her confidence returned and she started to pursue artistic endeavours that she always dreamed of but never actually had the courage to take up. Her kids responded incredibly well to the transformation too as they suddenly had a happy and fit mum keeping up with them all day long instead of a grumpy parent desperate for some peace and quiet. The moral of the story is that unless you set yourself a real deadline for your fitness makeover efforts you are likely to be going at it halfheartedly and therefore not see the stellar results you wish for. In fact, when you compare your lack of amazing results with what you heard other people achieve will further dampen your enthusiasm. You might even convince yourself that it’s not worth continuing and that it’s much easier to buy a bigger t-shirt. Although that’s true, it’s not entirely true. It’s all down to you. A coach can only give you guidance and iron out the kinks for you but unless you really want to change not much is ever going to happen. It’s all about taking action. If you would like to experience the same kind of fitness makeover as my client “Belinda” you can start right now by booking a complimentary breakthrough call to discuss your goals and intentions and how I can help you reach your best shape ever. There is no obligation to buy anything and it might just be the catalyst for you to get started or start over. This entry was posted in Lifestyle on 6 December 2016 by Cristina Alciati. I am always a little bit sad when Summer ends because I love the longer hours of daylight, the warmer temperatures, sleeping with all the windows wide open and finding excuses for spending time outdoors. Most importantly, I can upgrade my back garden to outdoors exercise area where I can enjoy a lot more space and plenty of fresh air. Clients are usually on holiday and so I get to slow down too for a short while. When Autumn starts life gets busy on all fronts again. Not just for me but for my clients too. For many of them the end of the year coincides with the end of their financial year and suddenly work brings a whole new dimension of busy-ness to their already packed lives. When I worked in corporate many years ago, from September onward I knew I would start at my job around 9am but I never knew when I would come home. Not only I had my usual tasks to deal with but heading towards the “festive season” meant more business lunches, more networking events, more parties and so on. I know, it sounds like such a hard life (not!) but believe me, having to kiss arse and get drunk in order not to disappoint clients can take a significant toll on you and your waistline in the long run. At the time I used to exercise in the evenings as I am a bit of a night owl but from September onwards it became virtually impossible to stick to a regular routine. Nowadays I witness the same issues with some of my clients who are often forced to cancel or reschedule their evening sessions at short notice. The only way that you get visible and long lasting results when you follow a weight loss and fitness program is if you are consistent with your efforts. It’s not different from running a business or working for one. In fact I look at my fitness regime as one part of the “business of me”: it has to provide the results I want and be enjoyable, in fact make that exciting. This helps me re-frame fitness as something that is vitally important to my own success both as an entrepreneur and as an individual striving to maintain optimum physical and mental health. The first step is always to (re)define your goals and be realistic about them. For example, if you know that you are coming up to an extremely busy few months with plenty of social events that you can’t get out of it might not be the best time to start working on your beach body. Unless of course the people you have to hang out with are also following a fat burning program and won’t mind discussing business over a rocket salad and a glass of still mineral water. It can be really difficult to stick to your meal plans when you are under a bit of peer pressure to have a few drinks and a curry. So if that’s the case why not allow yourself a bit of slack and revise your goals from going to the gym for weight loss to maintenance/damage limitation with perhaps a bit of slow progress as a bonus instead? You can still achieve a lot, you just have to make the most of the change in circumstances and go with the flow. I successfully used two strategies for my clients (and myself) to sail through busy times without any damages to the waistline. The first strategy is to alternate binge meeting and eating with fasting, i.e. have as many meetings as you can to include both lunch and dinner in one day followed by a day of fasting. The second strategy consisted of spreading out the meetings as much as possible and use the extra dinners or lunches as part of an intermittent fasting program. The ultimate goal here is to try and break even with calories in vs calories out with a little bit of extra help in the form of more movement and exercise when necessary. The thing is if you book a table at a restaurant that’s nowhere near a tube station or bus stop you will have to walk there and back. It’s always nice to do this after a large meal and it will help you sober up slightly if you have had one too many. I speak from experience. …hic! It takes a lot of commitment to yourself and your goals to stick to either strategy but if your health and fitness are important to you you will always find a way. Otherwise you will find excuses masqueraded as reasons. Again no different than running a business. Internet wisdom suggests that abs are made in the kitchen. I disagree. Abs are made in the gym and are revealed by wise use of your time and energy in the kitchen. If you can’t do the latter you must make sure you are at least focusing on the former for the time being. The thing is in order to achieve the perfect beach body (I am already thinking about next Summer here…) you have to build the physique and that requires consistent effort with your exercise. When you are super busy there is no need to get all complicated, you can save that for later when you have an easier schedule and you need to put the finishing touches to the solid foundations you have built. But, again, it’s important to make the time for it. The solution is super easy. You need to have strong boundaries with yourself first and your co-workers and bosses second, but you must make a point of not starting work earlier than your contract says unless extreme circumstances arise. This is an important part of achieving a healthy work-life balance: if you know your finishing time is a vanishing time you might as well start when you are supposed to and not a minute sooner. This gives you room to get up 30 minutes earlier than normal in the morning and stick in a quick 20 min. metabolic workout that as well as keeping your physique in tip top condition will also give you a little bit of extra energy for the day. There are many good ways to exercise at home with or without equipment: it depends on your personal preferences and what you are trying to achieve. I had a few clients in the past who used this strategy very successfully: they would see me at the crack of dawn to check in on their progress since my last visit and then put in a jolly good workout before going to the office. They got energised in the fresh air and started their day with a spring in their steps and their renewed confidence helped them make strides in their careers. Personally I hate getting up early in the morning but when I had to I soon learned to love the feeling that I got after a good workout and in fact I ended up getting up even earlier to do some extra work too. You don’t have to do anything fancy (but you can if you want to), if you stick with a few basic exercises focusing on form rather than reps or personal bests you can reinforce your neuro-muscular connections. This will ensure that your body is ready for muscle growth and increased strength. If you do this right you will get that sweet feeling of your metabolism burning fat all day long, making you feel a bit warmer and almost buzzing with extra energy. Your mind will be sharper and you will feel and look stronger giving you the edge in the business environment where presenting your ideas with confidence can make or break a career. If all you can do is work out for 20 min 3 times per week you will still get results and in fact you will be amazed at how remarkable these will be. Then when life allows it again you can go back to being more thorough with your fitness training program but that’s an article for another day. In the meantime if you would like some help finding the best way to get fit and lose weight through your busiest times with ease and grace book a complimentary breakthrough call now and let’s define some goals. Without obligation but with a lot of enthusiasm. P.S. If you are reading this article in the run up to Christmas you may want to check out my book “Burn fat, not the turkey” offering tips and tricks for navigating the holiday season in style whilst simultaneously avoiding crocodile tears on January 2nd. This entry was posted in Lifestyle and tagged entrepreneur, fat loss, festive season, fitness at busy times, stay fit when super busy, strategy on 28 November 2016 by Cristina Alciati. Step 4 – Stay Consistent To Keep Off That Stubborn Fat! I realize that you may have tried a fat loss program and diet in the past only to quit for some reason. If this is so, please accept the fact that this time, things really could be different for you! I know you’re searching for more happiness. The results that you’ll get by becoming more active and eating more healthily will allow you to become happier as a person and hopefully you’ll enjoy the journey as well. It’s the journey that will ensure your short and long-term fat loss success! Yes, there’s a reason why so many people (maybe even yourself) have failed to lose weight and keep it off before. Could it be due to the fact that the journey wasn’t as pleasurable as the old, unhealthy lifestyle that was put on hold? This time, the new journey towards your rapid and permanent fat loss results needs to become more pleasurable than the old, unhealthy lifestyle that you’re now leaving behind. To develop more confidence and peace of mind from knowing that you’ll be consistent after switching to a healthier lifestyle. Let’s begin by identifying the biggest reasons why a person stops, or is inconsistent soon after beginning a fat loss program or diet. It’s been my experience that someone can lose motivation if they’re not seeing quick fat loss results, or enjoying themselves while taking action to lose weight. In other words, try not to learn from trial and error but instead on what works, right away! Is there anything else that can stop you from adhering to a healthier way of life on a consistent basis? How about temptations and urges? Highly emotional situations can cause you to feel an urge to resort back to an old and unproductive action that brought you temporary pleasure despite the painful situation. So, if this action allowed you to feel relieved and satisfied in the past then there’s a strong chance you’ll act the same way in the future when reacting to a similar feeling. For example, let’s say you’re caught in a traffic jam and you’re now going to be late for an appointment. Due to the familiar stress, you suddenly have an urge for a cigarette, knowing full well that you vowed to stay away from them, for good. Then, you see the driver next to you with one in his hand, so you roll down your window and ask for one. All of a sudden you’re back to your old and unhealthy habit of smoking! Instead, couldn’t you have reached for a stick of bubble gum or a squeeze ball? Wouldn’t that be a healthier habit to form? It’s up to you in terms of what you reach for, yet I encourage you to go for the healthier alternative since you won’t sabotage your fat loss and health goals. Realize that it’s important to replace the unhealthy habit with the healthy, since you must have an alternative habit with which to preoccupy yourself with. Question 1: What are 4 unhealthy remedies such as smoking, drinking, potato chips and doughnuts etc., that you reach for when tempted, or have an urge as a result of any stressful situation. Also, state the reason as to why you subject yourself to each unhealthy remedy. Again, think of highly emotional situations that usually trigger a negative feeling. Lastly, identify the painful consequence of using that remedy instead of a healthier alternative. An Example Of An Unhealthy Remedy: A bag of potato chips. The Reason You Reach For That Unhealthy Remedy: After a stressful day at work, I’m often tempted and then make the decision to reach for a bag of potato chips. Painful Consequence Of Using That Unhealthy Remedy: Since I’ve developed the habit of reaching for a bag of potato chips for over a year now after stressful days at work, I’ve been feeling bloated and put on more weight as a result. You’ve now identified the unhealthy remedies you reach for during highly emotional situations and matched the painful consequences of resorting to them. Since it may be overly difficult to interpret the stressful situations in a positive light and feel great as a result, it would be wise to choose a healthier remedy in exchange to comfort yourself in the short-term. Question 2: Replace your unhealthy remedies with healthier alternatives. Afterwards, I’ll encourage you to explain how the switch will affect your health in a pleasurable and positive way! An Example Of A Healthy Remedy: Veggie sticks and yogurt instead of potato chips. The Pleasurable Benefits Of Using That Healthy Remedy: Using this healthy remedy instead of reaching for a bag of potato chips will make me feel less bloated and I’ll consume fewer calories and fat, while still satisfying my body. It won’t take long to drop a few pounds of fat due to this change. At this point in time a bag of potato chips may seem more satisfying to you than some veggie sticks and yogurt. The short-term pleasure from eating the chips isn’t worth the long-term painful consequence though, is it? As you keep the above in mind, you’ll begin to associate more pain in continuing on with the unhealthy remedy due to the way it causes you to look and feel. In return, you’ll associate more pleasure with the healthy remedy, which in this case, is the veggie sticks and yogurt. You’ll feel good afterwards instead of feeling bloated and will have the peace of mind knowing that you’ve done something really good for your body and overall health! Veggie sticks and yogurt taste better already, don’t they? However, I would recommend taking 1 day off every week when you can eat those sugary, salty and fatty foods. What else can you do to improve your chances of adhering to this healthier way of living on a regular basis? How about conditioning your mind with a positive and healthy affirmation! An affirmation is a statement that you hold close to yourself and repeat on a regular basis. It’s a positive reminder as to why you’ve decided to commit yourself to a new and healthier lifestyle. Your goal is to live by this statement and repeat it on a daily basis. This is a fantastic way of programming beliefs into your mind that you’re trying to adopt and works great for staying motivated. Question 3: Create a positive and healthy affirmation. I encourage you to repeat this statement every morning and during the day before your workouts. Continue on with this for at least 90 days and replace it with another as you go, if you wish. Your affirmation should be positive and exciting! Study the example below to assist you when creating an affirmation of your own. Example Of A Positive And Healthy Affirmation: My unhealthy lifestyle of the past is now a lesson that I’ve learned from. The fat loss related actions I take today will affect my tomorrow. So, I’ll enjoy the positive feelings and peace of mind knowing that I’m incorporating a smart fat loss plan into my life. I’m looking forward to gaining more energy, fitting into my good pants again and also inspiring others to change the way they look and feel in a positive way! The power of the spoken word is great. We talk ourselves into feeling certain emotions on a regular basis so why not convince ourselves to feel motivated and energized as often as we can? It’s possible to forget why you’re doing something good for yourself. If you forget – then your level of motivation will drop – so that’s why I suggest repeating a positive and healthy affirmation every morning and during the day before your workouts. This task will help you to guarantee a winning day for yourself! Moving along, I don’t know of anyone who doesn’t look forward to a pleasurable outcome. Waking up can be a difficult task if you refuse to get excited about working towards anything. Think back to a performance that you worked hard to excel at since you knew the spotlight would soon be on you in the near future. Do you remember a possession that you once desired, which gave you a new reason to save money? Would you say that upcoming performance or desire to own that special item increased your level of motivation towards taking the small but consistent steps of action that were needed for you to reach those goals? So, it would be wise to have something special to look forward to. How about an event where many friends and family members will witness your new body? Wouldn’t you like to wear a designer outfit that’s worthy of displaying your upcoming masterpiece? It’s always nice to get rewarded for your accomplishments, isn’t it? Question 4: What special event and possession are you going to reward yourself with once you achieve your fat loss goal in only 90 days? Lastly, we’re going to uncover a very important – yet often unnoticed – area of your life. It can literally make or break your up-coming fat loss success. Association is incredibly powerful and it’s up to you for creating your empowering network of associates. We don’t have a choice about who our family is going to be, but we can choose our friends and acquaintances. It’s safe to say that a little bit of them rubs off on you – and you on – them. Now that you’re about to get physical, please be aware that you may have some associates who will be rooting for you and others that will root against you. Have you ever heard of the old saying, “Misery loves company”? The last thing that some people want is a friend beginning to change in a positive way. The more that person changes the less the other person can relate to him or her and due to that, they can pull apart. For example, a group of friends are going out to eat at a favorite restaurant. One of them whose name is Sandy has just started to improve her eating habits, while also exercising on a consistent basis. Her friends looked at her in disbelief and then she needed to become defensive in order to back up her new and healthy lifestyle change. Let’s not even get into what happened at dessert! The fact of the matter is this, people change and it’s important to be aware of this and firm in your beliefs. Try to spend more time around people who support and encourage your fat loss efforts, while spending less time around those who bring you down. Ideally, try to find a friend with whom you can workout with. With each individual pulling for the other – since your fat loss success is dependant upon the others – you’ll increase the odds of adhering to this new way of life and experiencing rapid and permanent fat loss results. It’s time for you to realize that your body is the servant of your mind and anything your mind can conceive and believe, it can achieve! Yet, if you are lacking knowledge on the consistent steps of action that you should be taking in order to achieve rapid and permanent fat loss results, then check out “PFL90: The Ultimatte Psychologically Based Fat Loss Plan”. About the Author: Rich “Slayer of Stubborn Fat” Tweten is a Certified Personal Trainer and author of PFL90, The Ultimate Psychologically Based Fat Loss Plan. Since 1999, he’s helped thousands of people who’ve accidentally programmed their bodies to be overweight for life to achieve rapid and permanent fat loss results through the successful transformation of their mindset. Click here for more information on PFL90. Inside, ALL of the AMAZING psychologically based fat loss secrets are PACKED into a series of simple thought provoking assignments with questions that will help you to make that FINAL decision to begin working towards rapid and permanent fat loss results! This entry was posted in Lifestyle on 14 November 2016 by Cristina Alciati. After you make new and empowering decisions related to living a healthier lifestyle, I’m sure you’ll realize that there are more actions you’ll need to perform on an everyday basis. This will take greater personal effort, but if you don’t take the necessary actions that are needed now, it will take far greater energy in the future to start living a healthier lifestyle and to deal with the painful consequences which will follow. So, don’t get overwhelmed by looking at all the work that needs to get done. Instead, I encourage you to focus on taking everything one day at a time, or should I say one step at a time! By taking small but consistent steps of action to slay stubborn fat on a daily basis, you’ll succeed in adopting these “PFL90: The Ultimatte Psychologically Based Fat Loss Plan” found on the author’s website. Coming up, you’ll find an assignment with questions that are brought to your attention in a simple, step-by-step format. Simply print off this article – then write down your answers, or create a text file and type them out as you go. To learn how to improve your chances of taking the right steps of action on a consistent basis so you can slay stubborn fat rapidly! There are 2 preventable and potentially devastating reasons that people use to justify the fact they aren’t taking the action that’s needed in order to realize the great physical results they want to experience. The first one is called procrastination. When people procrastinate, they normally have a list of excuses as to why they aren’t acting in a productive manner. They feel that those excuses are legitimate and try to live guilt free. Maybe they are legitimate excuses, yet they are still excuses! From the way I see it, the only way a person can’t start to take small but consistent steps of action to slay stubborn fat is if they’re in a grave! We all have the same amount of time in a day and it’s up to us in terms of how we use that time. There are no dress rehearsals in life, so we should all strive to use our time as wisely as possible. The second preventable and potentially devastating reason is called giving up. By giving up there is absolutely no hope for a person to realize their fat loss goals and the only thing they can do from there is dream about what could’ve been and deal with the regret and painful consequences to follow. It’s obvious that you haven’t given up since you’re reading my words right now. Therefore, we’ll focus on the biggest excuses people use to cover up procrastination. Question 1: Identify all of the excuses you’ve used in the past and present to avoid taking the appropriate steps of action so you can slay that unwanted stubborn fat. Remember, that these excuses are all a form of procrastination. Afterwards, remind yourself how you were affected by using those excuses instead of working towards your fat loss goals. Lastly, I’ll provide a few tips that will help you to eliminate each excuse. Example Of An Excuse Related To Time: I told myself in the past that I didn’t have the time to exercise. With the kids, work and my other responsibilities it seemed impossible to take the time to look after myself. Example Of How I Was And Will Continue To Be Affected By Using That Excuse: By using that time-related excuse I missed out on 2 years of my life when I could’ve been healthier while feeling better about myself. If I continue to use that excuse, then I’ll gain more body fat and will lose extra energy as a result. Tips From Rich: Ask yourself how you can afford not to have the time! Making the time to exercise should be near the top on your list of priorities since your body is your most precious possession. It’s a possession that you’ll never be able to replace. By taking the appropriate action steps to improve your health and slay stubborn fat, you’ll gain energy and will become more efficient in the day and as a result, get more done! Look at your calendar and block off all the times when you’re booked up with usual responsibilities. Fit in three, 20 minute time slots for your weight training and cardiovascular workouts on alternate days of the week, or even on the same days if you wish. If you can’t find the time for exercise then you’ll need to cancel something else out that isn’t as high of a priority. Also, I’d encourage you to workout in the comfort of your own home, since this is more convenient than training at a gym. Make sure to schedule in your workouts ahead of time so you’ll have the peace of mind knowing that you already fit them into your schedule. Example Of An Excuse Related To Money: Currently, I don’t have much money to buy a gym membership and the food I need in order to lose fat. I can’t look after myself since I need to look after my family first. Example Of How I Was And Will Continue To Be Affected By Using That Excuse: By using that money-related excuse I now can’t fit into my good clothes that I used to wear. If I continue to blame my lack of activity and proper nutrition on a lack of funds, then I’ll gain more fat and won’t feel as good about myself. Not only that, but I won’t have the energy needed to take care of my family. Tips From Rich: If you can’t afford to purchase a gym membership that costs roughly $25 to $50 dollars a month, then I suggest looking for ways to fit it into your budget. If you’re looking to purchase in-home workout equipment, simply think of all the ways in which you can save money during the month. You can cut down on going out to eat, coffees, smoking etc. Keep cutting out unnecessary expenses until you can afford the tools that are needed so you can achieve your fat loss goals. As far as eating the right food goes, this shouldn’t be a problem for you financially since good food normally doesn’t cost more than the unhealthy alternative. If it is a stretch, perhaps use money-saving coupons to bridge the gap. If you’re truly living on a shoestring budget then I encourage you to invest in a reasonably priced set of free weights, a bench and a stability ball that should come with a one-time cost of $200 dollars, or less. With this inexpensive option, you won’t need to buy a gym membership or more expensive in-home workout equipment and can still take the action that’s needed to get great results from your exercise plan. Example Of An Excuse Related To A Lack Of Energy: At this time in my life I don’t have the energy to exercise, due to my hectic work schedule. Example Of How I Was And Will Continue To Be Affected By Using That Excuse: By using that lack of energy-related excuse I haven’t gained energy in the day and it’s only gotten worse. If I continue to use that excuse then I fear that I’ll become heavier and my performance will suffer as a result. Tips From Rich: If you have a lack of energy, then realize that there’s a reason for that. Could it be possible that you have low energy because there’s not enough activity in your life? A more active body is a more energetic one! The new activities that your body isn’t used to will force you to become stronger and fitter. Everyday activities will become easier as a result. Hopefully you’ve now decided to eliminate any excuses that you’ve been using to avoid exercise and healthy eating. After standing up to your own excuses and dismissing them, you’re now free to take the small but consistent steps of action that will slay the stubborn fat all over your body! This entry was posted in Lifestyle and tagged banish excuses, consistent action, excuses for not exercising, fat loss, pfl90, Rich Tweten, small steps, stubborn fat on 31 October 2016 by Cristina Alciati. Don’t let SAD drown your spirit. 5 tips for excellent mental health this Winter. No time to read this now? Pin this and read it later or listen to the blogcast! In the past few weeks (I am writing this in October, 2016) I have noticed a resurgence of social media posts about mental health to raise awareness and dispel the myth that it’s something to be ashamed of. I am totally on board with this as there is nothing worse than realising that someone who is near and dear to us is putting on a brave face to appear “normal” whereas in reality they are fighting an almighty battle with depression inside their heads all day every day. It’s not my place to discuss severe mental health issues or mental health programs as I am not qualified to do so and these should be the exclusive domain of doctors and psychiatrists. I am however professionally qualified to help clients cope and manage with mild occurrences of mood disorders like depression, stress and anxiety, also in conjunction with their medical consultants. Therefore as we are just about to enter the 5 months of almost perpetual darkness here in the UK I thought it would be good to look at a few health tips to help us stay cheerful while we count down the days to the next Spring Equinox. From my point of view as a fitness professional good mental health is a natural consequence of good physical health. Since I can remember I was surrounded by quotes from ancient Roman and Greek philosophers and the one that stuck with me is “Orandum est ut sit mens sana in corpore sano” i.e. let’s pray for a healthy mind in a healthy body (Giovenale, Satire, X, 356). Although at the time of Giovenale this line was meant to encourage readers to move away from the pursuit of fame and fortune and instead focus on their health, today “mens sana in corpore sano” has become the motto of many in the health and sports industry. The meaning slightly changed to suggest that in order to have a healthy mind you must first have a healthy body. Research seems to support this idea: a study conducted in the field of academic performance showed that pre-adolescent students who were physically active and healthy achieved better academic scores across a range of diverse subjects to include maths and reading. You can read the full study here (3). If you want to learn even more you can follow the references to similar studies conducted on adults, reaching similar conclusions. Keeping your brain healthy is in fact not that difficult and from my point of view it looks a lot like laying the foundations to become physically fit and healthy. You see, as always, there are no magic pills that will make up for a sedentary lifestyle with questionable nutrition and unhealthy habits like smoking, taking drugs and excessive alcohol consumption. However here are some health and wellness tips that will help you cope with the Winter months. Provided you are otherwise reasonably healthy and not taking medications that can cause you depression or anxiety, the first thing to look at if you are feeling down more often than up is your lifestyle and how this is affected by the time of the year. For example if you work a 9-5 job and have to commute daily chances are you won’t see much daylight Mon to Fri in the Winter months. The same goes if you work night shifts and sleep during the day: no matter what time you wake up, you will miss a lot of the daylight hours or miss out on your sleep. Daylight is important because it helps your body produce Serotonin which has been linked to positive moods and a calm yet focused outlook on life (4). This is great news for business: who doesn’t want to feel calm, happy and in control in every situation you may come across at work? Your best strategy in this respect is to honour your lunch break and go out for a walk whenever you can so that you can soak up some of the daylight. This is mandatory on sunny days. If at all possible make sure you have to cross a park to go and get your lunch but it would be even better if you could make that at home so you are 100% sure that your macro nutrients are carefully balanced. This will help you stay full for longer and keep cravings at bay thus reducing the chances of you over-consuming starches and fat (i.e. cakes, biscuits, crisps, pizza, etc.) later in the day. The next place to look at for great emotional health is your diet and, by association, your intestine because this is where the good nutrients you take in are processed and sent off to the various organs, including the brain. We want our gut to be as healthy and efficient as possible. We give it a hand by ensuring it is populated by “friendly bacteria” and that there is enough fibre going through to keep evacuation of toxins regular and smooth. Switching to a natural diet rich in fresh produce and poor in convenience foods will go a long way in ensuring your body is nourished and your moods stay stable. Once you have your lifestyle and nutrition under control you need to look at moving and exercising. There is a difference between the two: movement is what we are designed to do, exercise is what we have come up with to address specific goals. Truth is we need both to stay healthy and in good shape but if you are strapped for time or lacking inspiration then choose movement over exercise. A good walk around the shops is better than a half-hearted workout at the gym. Walking will give you a chance to relax and reflect on your day, making peace with yourself and the whole world. It could also be an opportunity to reconnect with friends and have a jolly good laugh. If you feel that you need a little bit extra help you may want to consider supplements. These are exactly the same supplements that I would recommend to anyone wanting to improve their health and fitness and lose weight. Why? Because when the body is healthy it’s more willing to release unwanted fat. The first supplement on my list would be a good multi-vitamins and minerals blend carefully formulated by a reputable company as opposed to the cheap-issimo you find at the local supermarket. The vitamins that are especially useful for brain chemistry are Vitamin C, E, Folate and B12 plus you need adequate quantities of magnesium, but there are many others that your body needs to function so don’t just focus on a few, go broad spectrum. Unless, of course, you have a known deficiency that your doctor determined via a blood test. The next supplements, which are really ex-aequo in order of importance with the above, are your Omega 3 oil capsules rich in both EPA and DHA. The latter is a major building block of the cerebral cortex, the part of the brain that is responsible for memory, language, creativity, emotion and attention (1). Omega 3 supplements are powerful anti-inflammatories and can help with joint pain too. Personally I got the most benefit in terms of improved cognition from taking Krill Oil as it’s a super powerful source of Omega 3 much stronger than even to strongest fish oil capsules. Amino-acids are also important and perhaps unexpected here. They are the building blocks of your whole body and will help you retain a healthy ration of muscle vs. body fat as well as helping you recover from exercise quickly. These are typically obtained from your food but if in doubt you could consider using a whey protein supplement which is naturally rich in amino acids. Finally, although we are encroaching into medical territory, let’s not dismiss the possibility of food intolerances as a cause of mood problems. Gluten intolerance has been linked to many mental health disorders like anxiety, depression, ADHD, autism and schizophrenia (2). Although for the majority of these conditions medical help is your priority, if in doubt it’s worth removing gluten containing foods from your diet for a while and see if you get better. To conclude, if you find yourself getting moody as the hours of daylight gradually disappear don’t feel bad because of it. As you can see there is plenty that you can do to take care of yourself and then there are doctors and specialists who will be able to help you if you can’t shake off the black dog. Remember that once the clocks go back and Summer time ends you are only a few weeks away from the Winter Solstice when the hours of daylight start to increase again. Might as well sit back with a cup of hot cocoa and enjoy catching up on the Walking Dead. Probably the only good thing about Winter. If you need help with any of this you can start by booking a complimentary, non obligation, 30 min breakthrough call. Beating the Winter sadness doesn’t need to be difficult and small actions can make a big difference. Book your call now! 1 – Greenberg JA, Bell SJ, Ausdal WV. “Omega-3 Fatty Acid Supplementation During Pregnancy”.Reviews in Obstetrics and Gynecology. 2008;1(4):162-169. 2 – Jackson, Jessica et al. “A Gluten-Free Diet in People with Schizophrenia and Anti-Tissue Transglutaminase or Anti-Gliadin Antibodies.”Schizophrenia research 0 (2012): 262–263. PMC. Web. 11 Oct. 2016. 3 – Darla M. Castelli, Charles H. Hillman, Sarah M. Buck, Heather E. Erwin,Physical Fitness and Academic Achievement in Third and Fifth Grade Students (PDF), in Journal of Sport and Exercise Psychology, 2007. 4 – Mead MN. “Benefits of Sunlight: A Bright Spot for Human Health”. Environmental Health Perspectives. 2008;116(4):A160-A167. This entry was posted in Lifestyle on 24 October 2016 by Cristina Alciati. I’m about to guide you through an exciting and fun journey inside your imagination. What once was the impossible dream is now going to become very real as you visualize exactly how your new body is going to look and feel after using an effective exercise and nutrition plan for 90 days. By seeing the target and aiming for it, you’ll have a much greater chance of hitting the bulls-eye! However, before you answer the first question, make sure to open a text file so you can simply type out the answers as you advance. To set the reasonable fitness goals you need to achieve in 90 days. Walk over to a comfortable chair and relax in your seat. Read through the following assignment until you arrive at a question. Afterwards, shut your eyes and visualize exactly what you see and feel. You’re now watching over yourself as your spirit has left your body! Question 1: What are the 3 everyday tasks that are going to be easier for you to perform in only 90 days? Think of walking home or climbing up a flight of stairs after a long day at work. Before you answer, visualize yourself performing the task with ease. How do you feel now as you’re lighter on your feet and quicker as well? Example: Standing up and walking around the office. Question 2: What are the 3 objects that you’ll be able to move or pick-up more easily in only 90 days? Think of a bag of groceries or a child. Before you answer, visualize yourself lifting, pulling or pushing the object. How light does it feel now compared to before? Example: Moving the couch out of the way as I vacuum. You watch yourself stand up with good posture and then walk towards the same mirror you stood before wearing only your underwear or bathing suit. Question 3: What do you see in the mirror after following an effective exercise and nutrition plan for only 90 days? Before you answer, visualize the way you look and feel, then describe your facial expression. Where do you notice the loss of inches? How much definition do you see now and where is it most striking? How does it feel when you rub your hands all over your body? Be as descriptive as possible in your response. Question 4: What is the size of the outfit that will fit you just right in only 90 days? Before you answer, visualize the way you appear in the outfit. Describe how it looks and feels on you now compared to before. If you don’t have an outfit you like that doesn’t fit you right now, is there one you’d like to buy? If so, describe it and how you can see yourself appearing in it. Question 5: How do you feel now as you’re admiring your rapid and permanent fat loss results? I encourage you to complete all of the previous questions to get the best possible results. Does that image of your new body appear after closing your eyes? I’m sure it does, as it’s burning you up inside to reach that thrilling goal! What we’re about to focus on now is what influences you to make decisions. Decisions, that lead to specific actions which will guide you towards the rapid and permanent fat loss results you desire and deserve. The strong magnetic force that causes you to make a decision lies in what you believe. In this next step towards guaranteed weight loss, I’m going to help you to identify and confront your beliefs head on. Afterwards, I’ll show you how to break down the unhealthy beliefs that hold you back and replace them with healthier alternatives so you’ll have a much greater chance of making the right lifestyle decisions on an everyday basis! Guarantee the weight loss results you crave by breaking down your unhealthy beliefs. This entry was posted in Lifestyle and tagged body transformation, fat loss, pfl90, reasonable fitness goals, visualisation, visualization on 17 October 2016 by Cristina Alciati.